The interview with Steve Lopez captured my imagination. I was surprised and delighted by what touched me in this interview: Keep breathing. Writing. Having a time and place to read one’s story for others. These words, these thoughts bring joy to my heart. Keep breathing . . . sure, I hear that phrase often under various circumstances, some funny, some not so funny. 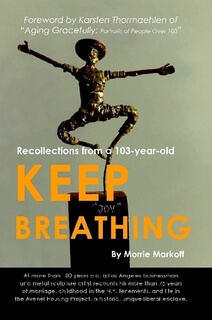 But in the case of Morrie Markoff, at age 103, I laugh with its simplicity. Is that not what we all desire, a simple, direct easy secret to longevity, just keep breathing? In the Sunday interview with the author, Markoff goes back over his one hundred plus years with details of love, work, family, war, peace, joy and sorrow. And always the background moment-to-moment awareness of breathing. In writing this piece for my class, I began discovering what captured my imagination. For me, this simple statement—keep breathing—raises a big question. The image of the grim reaper comes to mind. Who decides who gets to keep breathing? Having just completed a three-year crash course into learning how to grow old, I saw that breathing took center stage and it became my teacher. I must confess the experience more often than not (a little black humor here) took my breath away—the details of which are for another writing time. But for now, I am playing with my words for successfully living well no matter how many years plus one might have added up. My words today . . . Be willing. Mary Lu Coughlin sees herself primarily as an educator. Her venues have included: elementary schools, teacher conferences, nursing homes, food coop customers, county jail inmates, emergency food pantry families, and one favorite audience: Trappist nuns wanting to learn about laughter and hugging as a path to wellness. Since 1984 she has devoted her life to co-creating, first with her business partner and friend, Nancy B. Rez, RN, MA, a holistic healing center and bookstore, and now those considered co-founders are in the hundreds. Leilani Squire and her veterans' writing group currently add their energy to help lead Wellness Works Glendale into the 21st century. Always, the vision that holds her heart to the plow is creating an open space for soul-filled storytelling. Read more articles by Mary Lu Coughlin. All original work attributed to Mary Lu Coughlin © 2017 Mary Lu Coughlin.